In a little over a year, many of Minnesota's youngest students will be spending more time in the classroom. 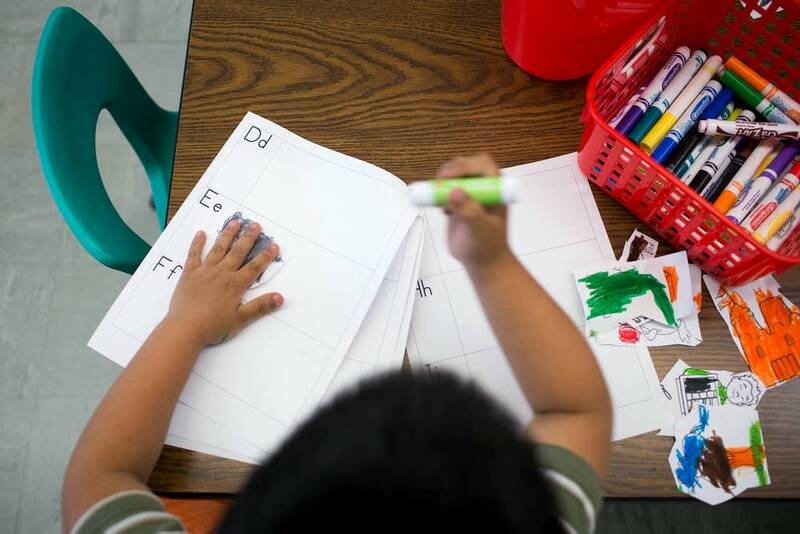 State lawmakers this spring approved $40 million in funding for all-day kindergarten and more money for pre-kindergarten scholarships for children from low-income families aiming to close the gap in standardized test scores between white students and students of color. That's enough money to provide scholarships to about 10,000 children from low-income families in each of the next two years. By the fall of 2014, students in all of Minnesota's 337 school districts will have access to free all-day kindergarten thanks to a $134 million boost in funding approved by state lawmakers. Researchers say access to early childhood education is a critical step in ensuring that students do well from the start. Studies have found that gaps in learning are already wide when children enter school; children living in poverty, for example, know far fewer vocabulary words than their more-affluent counterparts. 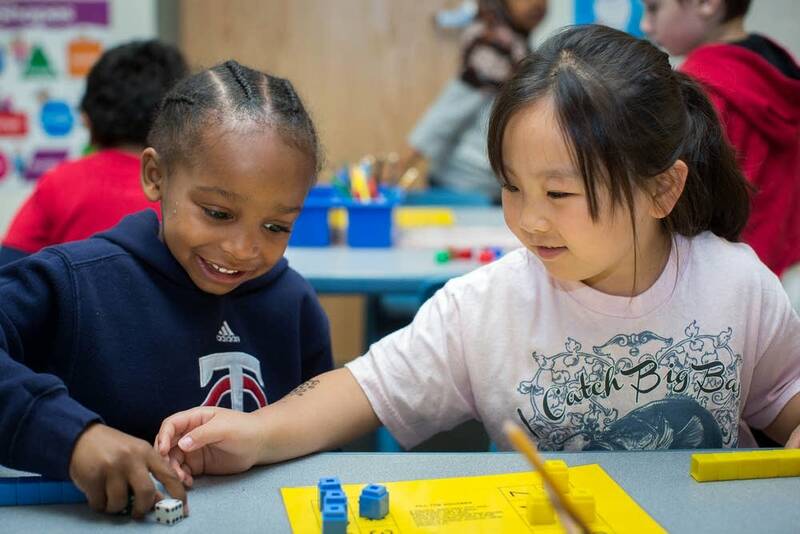 Megan Gunnar, director of the Institute of Child Development at the University of Minnesota, points to years of research showing students who attend quality pre-K programs continue to do well not just academically but in other areas as well. "They were more likely to finish high school, they were more likely to get a job, they were less likely to be incarcerated," she said. Even if the academic benefits of pre-K programs fade in later years, as Gunnar said some studies have suggested, the social and decision makings skills students gain will help them throughout life. University of Chicago economist James Heckman has found that quality early education yields a 7 to 10 percent return for every dollar spent. Despite the research showing its potential benefits, state legislatures across the nation cut funding for early education as their economies slumped during the Great Recession. As the economy begins to improve, many states are again investing in pre-K programs. In Minnesota, the state is making up for years of shortchanging its education budget, Gov. Mark Dayton said. "More money for education doesn't absolutely guarantee success, but less money for education absolutely guarantees failure," said Dayton, a Democrat. "We're not going to improve test scores, close the achievement gap, or get our kids ready for a very competitive world by reducing the investment in education." Minnesota education officials say they've already seen how young students benefit from more time in the classroom. Most of the state's schools offer full-day and half-day kindergarten. Among them is Little Canada Elementary, where during the final week of school the half-day kindergarten room buzzed with the type of morning energy that only five and six-year-olds can produce. In a cramped room, 20 kindergartners sat in pairs across from one another at small tables, where they rolled dice and added the totals. To the students, it was a fun game. But it was also a math exercise. Teacher Melanie Houff crams in as much math, reading and writing as she can in the two and a half hours she has with the students every day. "There are days though where we can't get it all in," Houff said. "But we sure try." The setting was much more relaxed across the hall in the full-day kindergarten classroom, where Pang Moua's students pasted pictures in a book printed with the alphabet. Their job was to match up each picture with its corresponding letter. 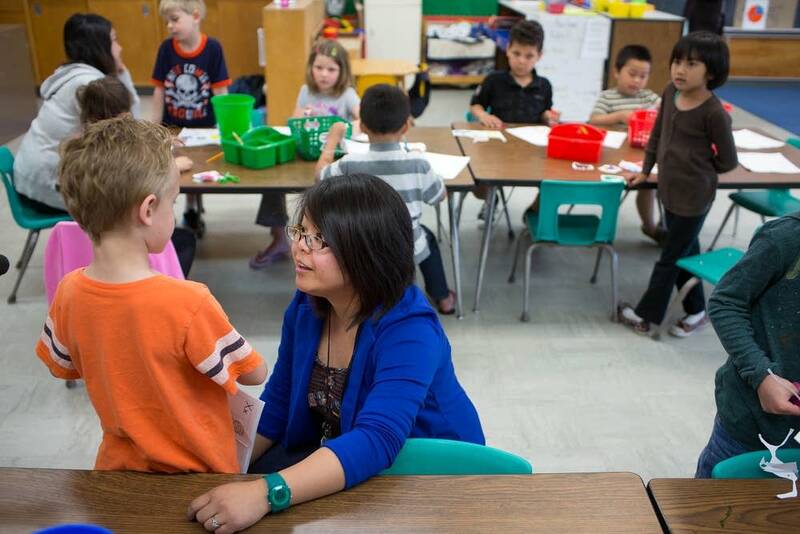 Moua has taught full-day kindergarten at Little Canada Elementary for two years. Before that she spent two years teaching half-day kindergarten. For her, the difference between the two classes is clear: a full-day of kindergarten offers a richer experience for students. "It provides kids an opportunity to explore what they've learned, to make inquiries of what they've learned, and to start implementing what they've learned," she said. Students in both full-day and half-day kindergarten at Little Canada Elementary cover the same basics, but full-day students also take part in art, gym, recess and lunch, activities Moua thinks better prepare them for first grade. As in many Minnesota communities, parents in Little Canada pay more than $3,000 a year for all-day kindergarten. Free all-day kindergarten will relieve a financial burden on the school's parents, said Garin Bogenholm, principal at Little Canada Elementary. More importantly, he said, it will give the school time to work with students from low-income families. "This will provide us more opportunity to work with those students in a full-day setting that haven't had those pre-school, formal opportunities in the past," he said. Bogenholm said teachers are confident that all-day kindergarten better prepares students for a good start in school. But research is split on the effectiveness of all-day kindergarten. While researchers can't seem to find negative consequences, some studies find little difference between kindergartners who attend all day or for a half day. Other studies have found students in all-day kindergarten do better academically in later grades, and have better social skills. The debate over all day versus half day is in some ways beside the point, according to Art Rolnick, a senior fellow at the University of Minnesota's Humphrey School of Public Affairs and former director of research at the Federal Reserve Bank of Minneapolis. He's dedicated himself as a researcher and an advocate to improving the quality of pre-K education. "While all-day kindergarten is fine and it's a nice thing to have, we've really got to get to the kids earlier," he said. Rolnick said Minnesota is off to a good start, but maintains it would cost at least $150 million a year to provide quality pre-school to all of the state's neediest children. Rolnick and other early childhood education advocates aren't happy with a $5,000 per student cap on the scholarships. They say quality pre-K programs can cost upwards of $10,000 a year. "It means that families that are eager to send their children to a program that may cost more than the cap allows will be left out of an opportunity to have year round pre-K," said Daniel Sellers, executive director of the education reform group MinnCan. Sellers' group plans to lobby for an increase in the scholarship cap next legislative session. Minnesota's new financial support for early education programs comes after several tough years for programs across the country. In 2011-2012, state spending on pre-K per child dropped in 27 of the 40 states that fund preschool, to its lowest point in 10 years, according to the National Institute for Early Education Research. While three states improved in quality according to NIEER standards, seven slid backward. And for the second year in a row, enrollment of four-year-olds in pre-k remained stagnant. But Jim Squires, the senior research fellow at the institute, claims things may be turning around as states start to invest more money in pre-K programs. "We are hoping that we are pulling out of the Great Recession and that children, early childhood, will be one of the first beneficiaries of that turnaround," Squires said. A recent study by the Education Commission of the States found that after years of stagnant or declining funding, states added $181 million to pre-school programs in the 2012-2013 school year. Mike Griffith, a school finance consultant for the commission, expects more states to increase funding for pre-K in coming years. "It's a popular program all the way around ... with parents, educators, legislators, policymakers, those in the research community," he said. "I think the feeling is if the money is available then this is going to be one of the priority areas." The White House is also getting behind the push for more pre-kindergarten funding. The Preschool for All program is part of an Obama administration push to provide pre-K to every low and moderate-income four-year-old in the United States. It also encourages states to offer free full-day kindergarten. To fund the new $75 billion program, the president has proposed raising cigarette taxes by 94 cents a pack, which has been met with resistance by the tobacco industry. If the plan is enacted, Minnesota would have to invest an additional $3.9 million to receive $38.7 million from the federal government for the first year, and the grant would serve nearly 5,000 children. "We know that children from low-income families begin school, on average, 12 to 14 months behind their peers in language development and pre-reading skills," U.S. Education Secretary Arne Duncan said last month as he pushed the new initiative. It is likely to face opposition in Congress, particularly in the House, where Republicans are resistant to any expansion of government programs. But Duncan said efforts to improve early childhood education can't wait. "Simply put, that is morally and educationally unacceptable," he said. "And from a long-term, economic-competitiveness standpoint, it is just plain dumb." This article was produced with the support of The Hechinger Report, the nonprofit, nonpartisan education news outlet based at Teachers College, Columbia University.